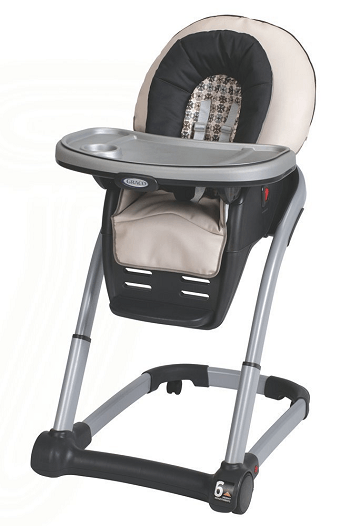 Baby Safety Gate Review for Munchkin Easy-Close Gate - it's BABY time! 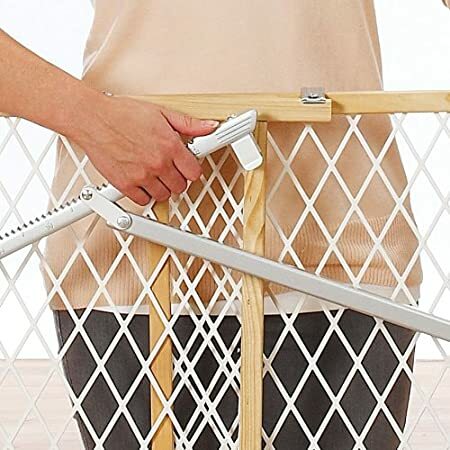 Baby safety gates are one of many methods you can use to baby-proof your home. Not everyone requires them but for those who do they come in quite useful. When our first child was born we lived in a different house than we do now and didn’t really need them. After we moved, however we found that it would be really useful to keep her from going into areas where we didn’t want her to go and still use them today with our son. You can’t keep a child in a play pen all day so a safety gate was an easy solution to give them more room to get around while keeping certain areas off limits. We tried a couple of different ones before we found one that we loved. So here is my baby safety gate review on the Munchkin Walk-Through gate. Let me be fair up front by saying the second safety gate we purchased was of a different type than your traditional safety gate. Little had I know beforehand that they made ones you could actually walk-through. I was still living in the old days of the wooden-style ones like we had for our cat. So before I continue on with my review let me first explain the difference between these two types. A basic safety gate is one that fits in a doorway and requires some form of mechanism to open it which you position to lock in place and lift it to slide open. These typically need to be removed in order to get through then have to be put back in place or, if it’s made low enough, you just walk over it (usually low enough for adults but too high for toddlers). They have different types of these and some are made more durable than others. We originally had the wooden position and lock ones because they were much cheaper and we needed more than one, but they were flimsy and turned out to be just a waste of money. Walk-through gates are those that are made where the mounting remains stationary whether pressure or wall-mounted and it features a gate ‘door’ that you can swing open and closed. 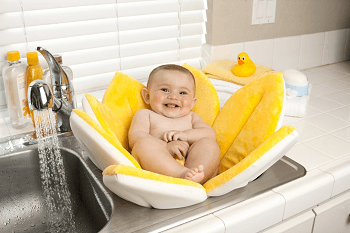 They can be locked into the closed position so babies and toddlers can’t open them easily but parents can. These are typically more expensive, but they’re more durable. I’ve actually seen some standard gates go for more than certain brands of walk-thru gates. After becoming frustrated with the position and lock wooden safety gates we had before, having had to remove it each time or running into it while carrying something large because I forgot it was there, I was ready to move on. I visited a friend’s house where she had the walk-through gates and I was amazed. She told me how much she loved them so I sought out to get my own. Why didn’t I buy one of these sooner? 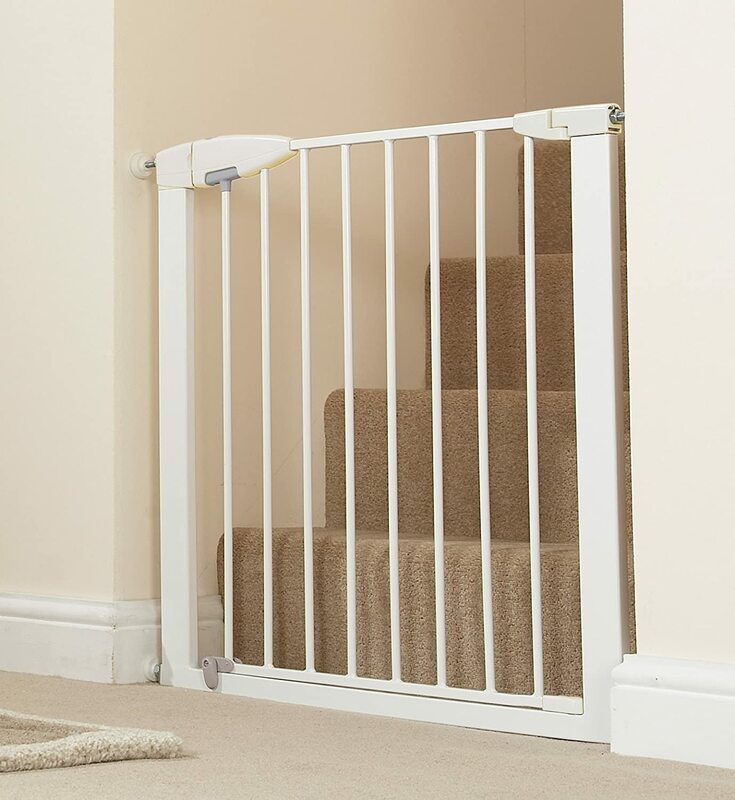 Perhaps the cost, initially deterred me considering that I needed to buy two of them but the Munchkin Easy-Close Metal Gates are really a great value in the long run. I originally bought these for my daughter who is now 4 years old and we still use it as now our son is crawling everywhere. How I love this safety gate over the former ones we had, let me count the ways. This safety gate is constructed of steel so it is really sturdy and stays well in place when it’s properly mounted. The installation is pretty simple. It is a pressure-mounted gate that has mounted wall cups to provide a snug fit without damaging your walls or the door frame. For optimal security they advise mounting the wall cups with a screw but they have self adhesives to stay in place and you just tighten the bolt to secure it. You can install it anywhere in doorways or at top/bottom of stairs. I love how functional this gate is. It has double lock handle feature that makes it really easy to open with just one hand but child-proof to where kids can’t figure it out. The recommended age limit says 3 years but my daughter is 4 and still has not mastered how to open it. What’s nice is the extra lock on the bottom that is optional. It allows you to be able to open the door in either direction or you can fix it to open in just one direction or locked in place. The gate is made to adjust so it fits doorways 29 1/2 to 35 inches and comes with an extension to expand it for wider doorways. There are additional extensions you can buy separately if you have an extra wide opening. This wasn’t the exact same gate as the one my friend had because hers had a slimmer walk-through design. This one offers a wider area to walk-through which makes it easier when I’m carrying a basket of clothes to the laundry room so I don’t have to lift the basket over the gate. One of the main features I really liked is that unlike the ones we had before that you had to uninstall each time you go through it, this one stays in place while allowing you to walk through in and out. I can leave it in the open position when the kids aren’t around and close it easily enough with just a push and it locks. There is one minor flaw with this safety gate that many walk-through gates have aside from the ones built for top/bottom of stairs. The gate features a U-shaped frame that supports the ‘door’ of the gate. There’s a bar that goes along the floor that doesn’t move when you open it that you have to be mindful of to walk over when stepping through or leaving the gate open. This bar can cause you to trip over it and our daughter has on a few occasions. This really has only happened when the gate was left open as we’re pretty aware of it when we open the gate, so as a recommendation it might be best to leave the gate closed to minimize this risk. 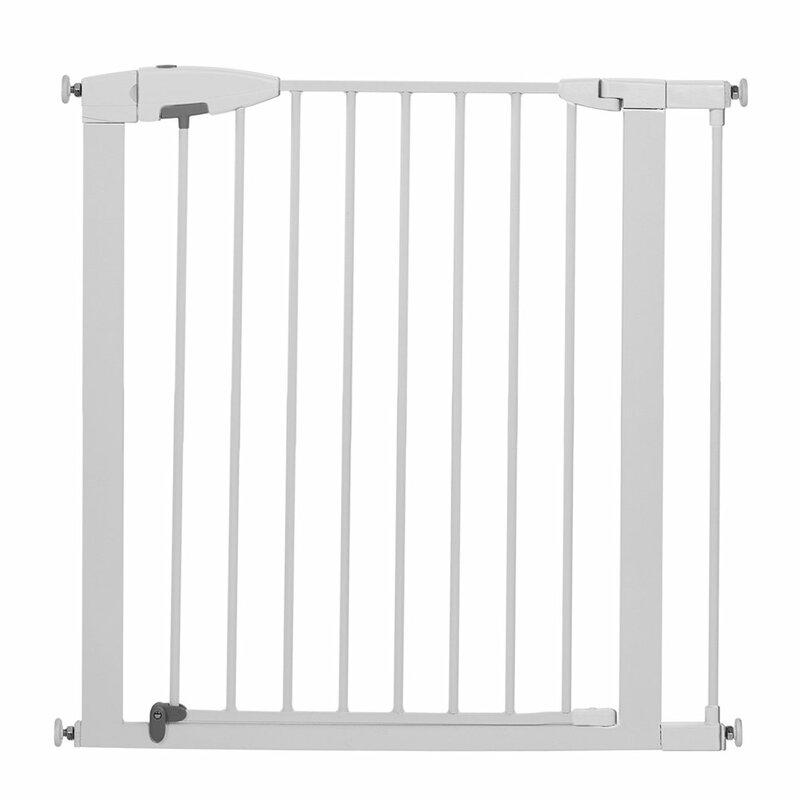 It’s clear from my baby safety gate review that I really like this gate on so many levels. However, as always I like to include an unbiased perspective based on others’ experiences so here’s what other buyers have said about it. These reviews were paraphrased for convenience. 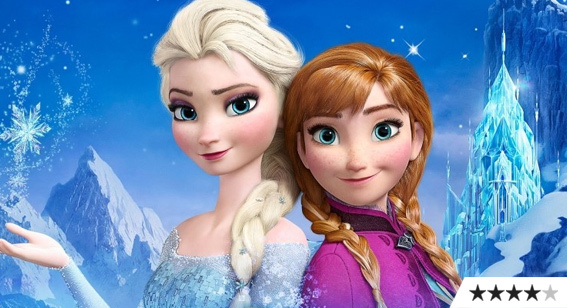 You can see the full reviews here. This gate seemed perfect for us. 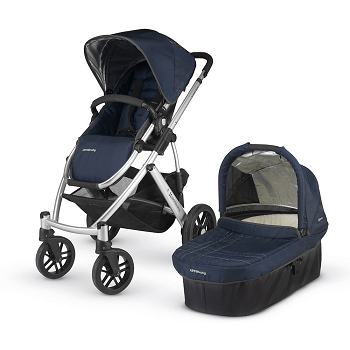 In my opinion it is a really great value because it lasts through the years and works great around smart toddlers. In fact, hardware mounted safety gates such as this one are considered the safest choice and recommended by consumer reports as well. My only suggestion is that if you have stairs that you want to put up a safety gate, choose one that is specifically designed to be installed for the top of the stairs. These do not have a fixed bar at the bottom so they don’t pose the risk of tripping and are more secure. Based on my overall experience I would certainly recommend this gate. As always I hope you found this baby safety gate review helpful if you are considering purchasing one. 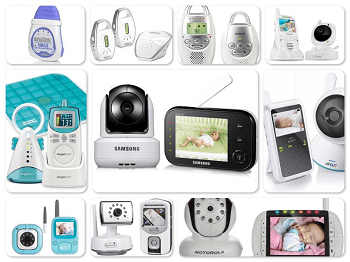 Also be sure to check out our baby-proofing checklist for other areas of the home.